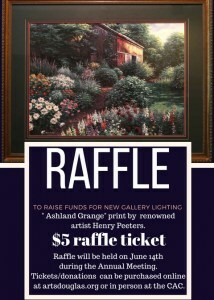 The CAC announces a raffle for a chance to win “Ashland Grange” print by renowned artist, Henry Peeters. All proceeds raised will go towards new gallery lighting. The winner will be announced at the annual meeting on June 14th at 6 pm. Raffle tickets and donations can be made online by pressing the “donate” button on the right hand side of the screen or in person at the CAC. For more information or questions, please call us at 770.949.2787. Thank you for your support! ← Annual meeting – It’s a new year!